I’m always grateful for movies that come out of left field, however flawed they may be. Screenwriters and directors who take chances are to be treasured. 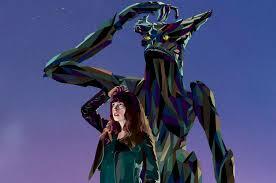 That doesn’t mean, I’m sad to say, that Spanish writer-director Nacho Vigalondo’s Colossal is an unqualified success. Truth to tell, it’s hard to know what to make of this film which affixes a fairly ordinary human drama to a monster movie. The delicious Anne Hathaway plays Gloria, an alcoholic who gets turfed out of their shared New York flat by her disapproving boyfriend, Tim (Dan Stevens of Downton Abbey fame) because he only gets to see her when she’s in the throes of yet another hangover. Gloria decides to get her act together by relocating back to her small town home where she links up with an old school chum, Oscar (Jason Sudeikis), and starts working at his bar, not the most appropriate of jobs for a lush. This ho-hum narrative is then rather outlandishly joined at the hip by a shocking event in Seoul, South Korea, where a monster that looks an awful lot like Godzilla starts trashing the city. To her extreme consternation, Gloria starts to identify with the monster, gradually coming to believe that, in some weird way, she and the creature have plenty in common. At this stage, you may be delighting in what you believe to be a witty extended metaphor about how excessive drink can bruise your persona as well as damage others, or you may be tearing your hair out, concluding that this tale is illogical, far-fetched and stupid. The most generous assessment is that there’s a bit of both in this movie which probably only got made because Hathaway agreed to come on board as the film’s star and executive producer. Either way, you’ll probably be grateful for Hathaway’s presence, as she holds the movie together with yet another beguiling performance. As for the whacky plot, if you love the movie you’ll probably find a way to make sense of it. One question that may fairly be asked, however, is that if Colossal is an investigation, at least in part, into an alcoholic’s destructive self-image, why do the people of Seoul have to suffer? Or is this movie also an oblique attack on American imperialism? The mind boggles.